It's been a while since I've done some dynamic, motion-conveying long exposure, and several weeks ago, shooting at Paradise Bay with some friends provided the opportunity to do so. This angle was a little different from some of the other Golden Zephyr long exposures I've posted, and I really liked the spotlights in the distance form Hollywood Land. All in all, the resulting colors and illumination make for a very pretty but action-filled photo! 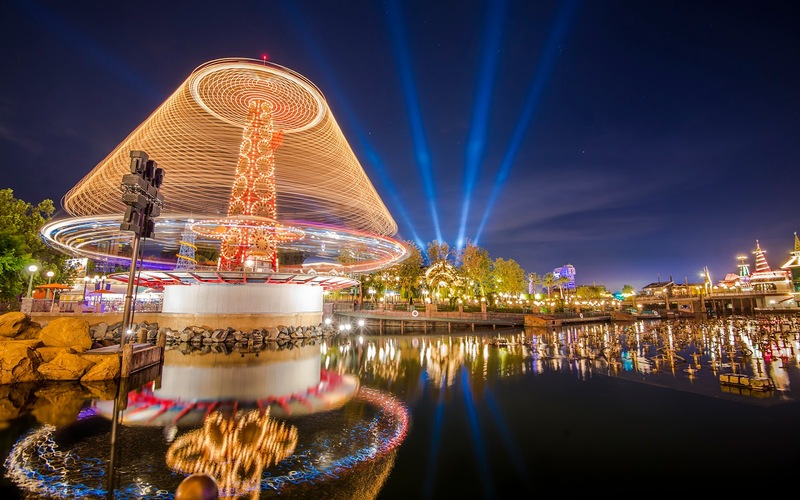 The Golden Zephyr spins in a long exposure, as spotlights from Mad T Party shine beyond.